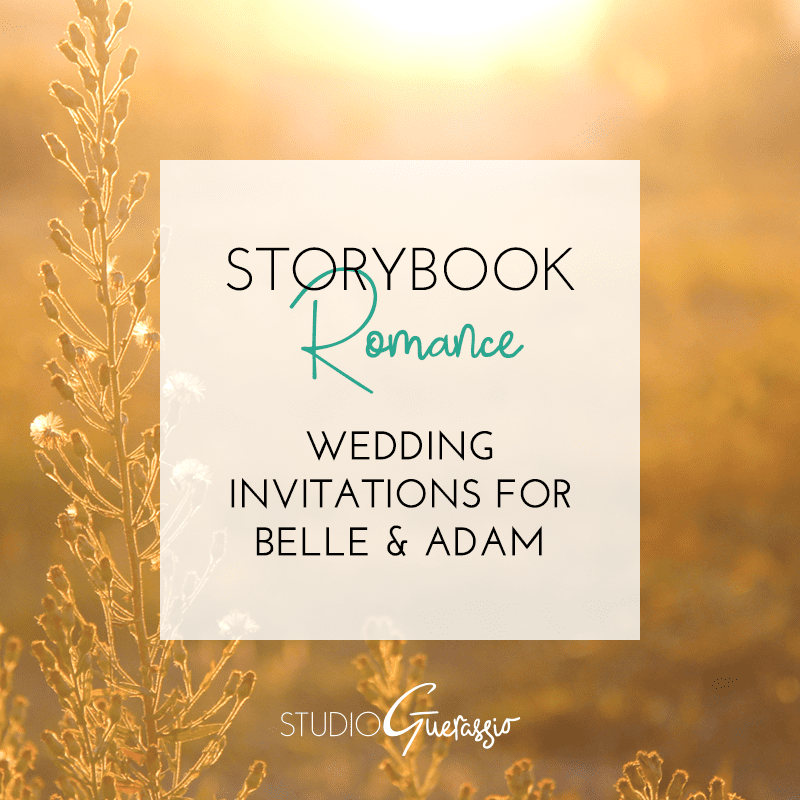 Ready to see the next set in my Storybook Romance series? In case you missed the last one, this is where I design wedding invitations for famous fairytale and literary couples, with my own modern twist. Please note these are a personal creative project, not samples of items for sale or reproduction. 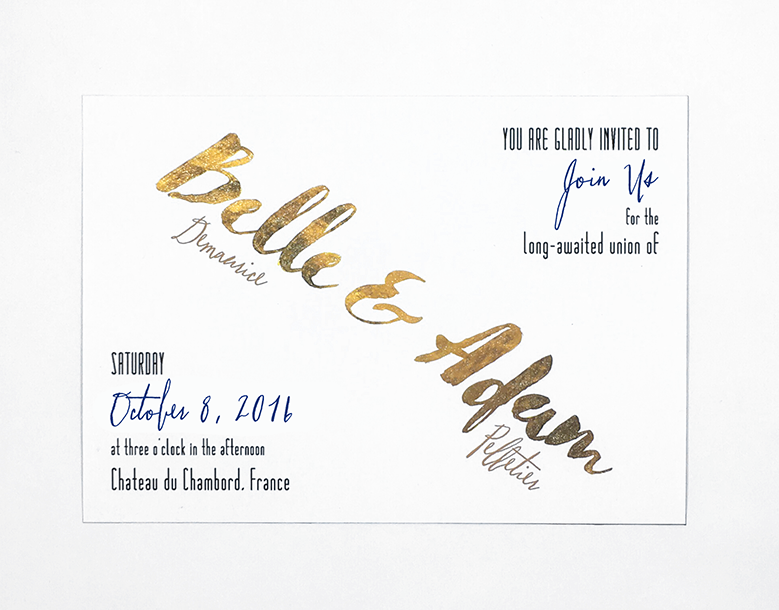 A wedding invitation suite for Belle & Adam* from Beauty & the Beast. This one took me a long time, because I wanted to get it right. Beauty & the Beast has long been my favorite fairytale, and I wanted to do it justice. 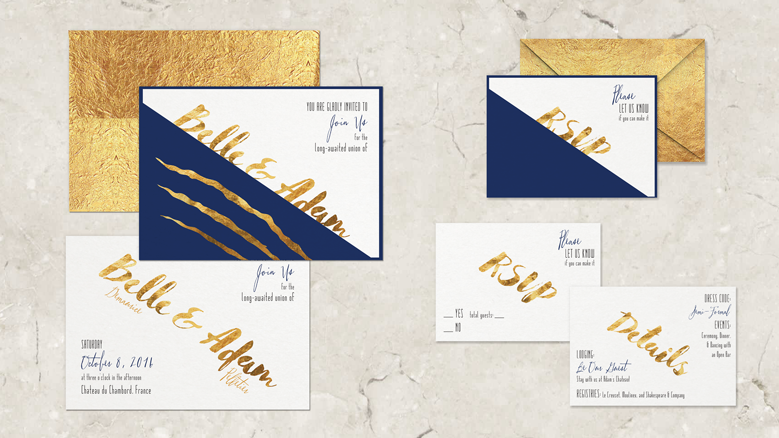 The color scheme for this set was immediately obvious: gold and navy. The Disney version of Beauty & the Beast is just so iconic now, particularly the gold dress and blue coat from the ballroom scene. And that’s a great color scheme to work with on its own. So that part was a no brainer. Less obvious was what direction to take it stylistically. Do I go bookish for Belle’s love of books & reading? Do I incorporate a rose for the curse? Or a mirror, or a tea cup, or castle, or any number of things. Ultimately I couldn’t find a way to do something like that without going too kitschy or on the nose. I decided to let the colors do most of the speaking, with the rough brush font and stylized claw marks supporting that idea. I also tried to strike a nice balance between the opulence of Adam’s position as a prince (hello, have you seen the castle the Beast’s castle was modeled after?) and Belle’s no-nonsense attitude and background. The detail wording is very to-the-point, and typographically a simple contrast to the feature brush font. 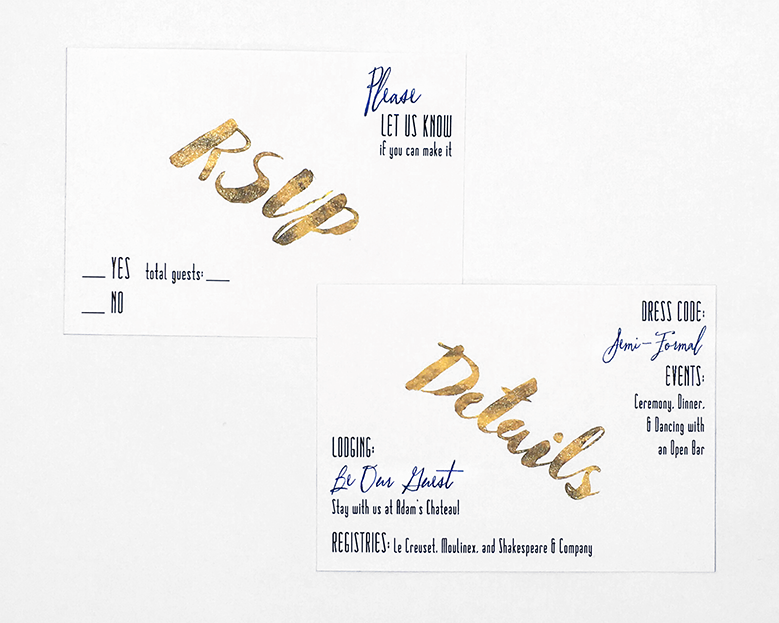 The main invite is A7 size, and the RSVP and details** cards are A1. 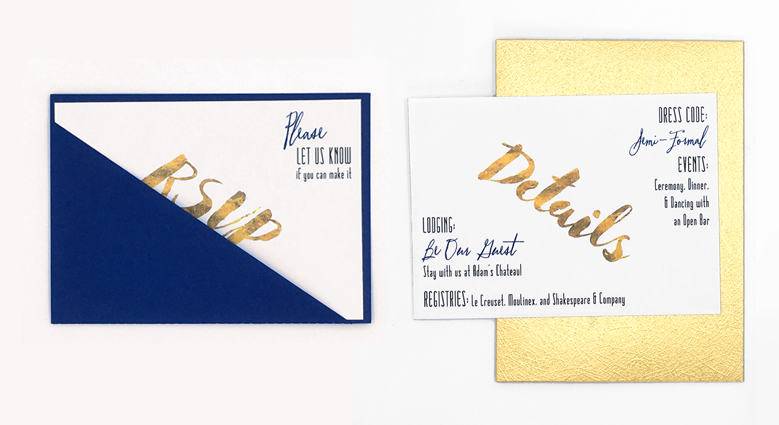 Each size has a dark blue holder, with a sharp diagonal edge that aligns with the gold text on the cards. Slide the card out or flip the foldover down to read the rest of the info on the card. The cards themselves are printed on white card stock, and (though my home printer can’t do this) would feature gold foil text. The envelopes are textured gold paper. I’ve already picked out the next set I’m going to do. It’s going to have a much edgier look, and I’m kind of excited about it. Stay tuned for the next installment of Storybook Romance to see who is next! 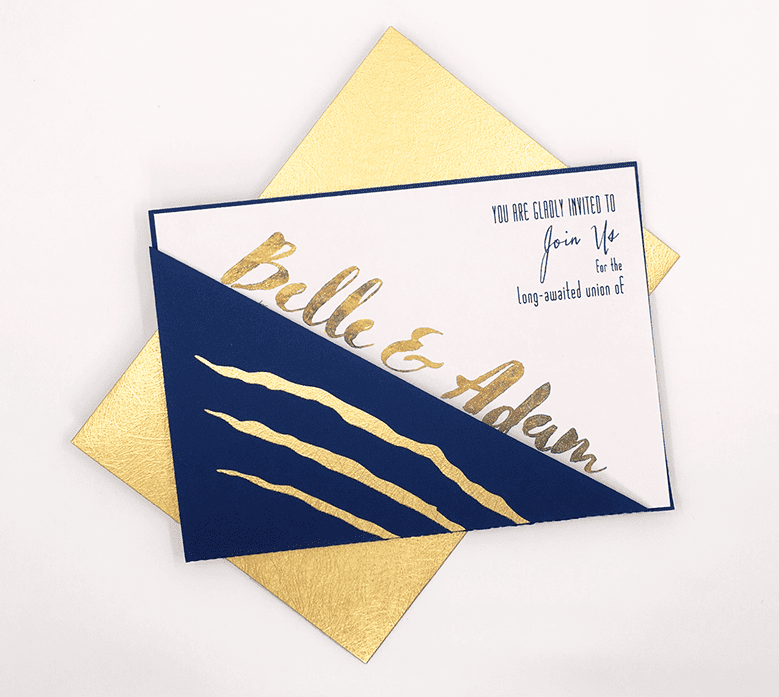 What do you think Beauty & the Beast’s modern day wedding invitations would look like? *No, he didn’t have a name in the Disney movie or the original story. But they gave him one in the Broadway musical, so I went with that. I also made up the last names that appear on the invite. **Yeah, that’s right, I snuck in a Be Our Guest reference!